When you need a post-workout recovery drink, there’s FitAid. When you need to pull a late night studying, there’s FocusAid. When your looking to stay up all night for a wild time, there’s PartyAid. And when all that activity finally catches up to you, now there’s ImmunityAid. 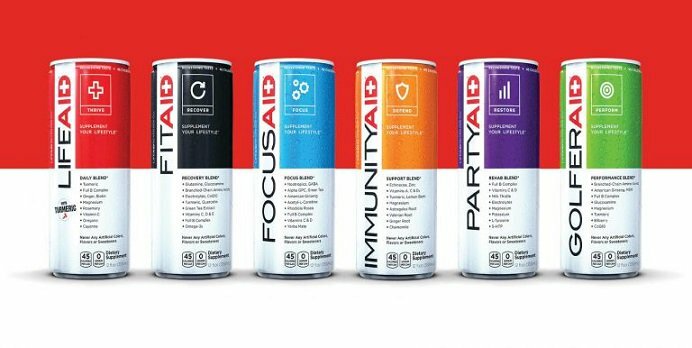 ImmunityAid is the latest product from LIFEAID Beverage Company, a brand of functional beverages that serve specific consumer need states. The new orange-flavored SKU launched today at the National Association of Convenience Stores (NACS) Show 2018 in Las Vegas, running Oct. 8-10 and will soon be available in about 2,000 stores nationwide, including Whole Foods, H-E-B, Vitamin Shoppe and GNC. Speaking with BevNET, co-founder and CEO Orion Melehan said the new line fills a consumer need for immunity-based beverages, and will also ideally help the company to maintain velocity during the winter when beverage sales drop but colds and flus rise. Melehan said that when speaking with convenience buyers there is an increased focus on c-stores building out functional sets, separate from the existing sports and energy drink sets, and LIFEAID sees this movement as a chance to become a leader in the space. Made with a blend of A,C, and D vitamins, zinc, turmeric, ginger root, chamomile, astragalus, and echinacea, ImmunityAid is labelled as a dietary supplement and contains 45 calories per 12 oz. can. It will retail for $2.99 per can. According to Hinde, the company received feedback from consumers and from buyers at some of its top retail partners, including Whole Foods and H-E-B, to develop the new line. He added that nearly three-quarters of U.S. consumers currently take some form of nutritional and wellness supplements, and the company believes ImmunityAid could quickly become the “number two or three” top selling SKU across the brand’s product portfolio. Currently the flagship FitAid line, marketed as a post-workout recovery drink, remains the company’s top-selling SKU across all channels, with its nootropic-based FocusAid line matching roughly 80 percent of FitAid’s volume. According to Hinde, the company has so far put very little of its marketing arm behind FocusAid, but an organic trend for more controlled, better-for-you energy from millennial consumers who are seeking alternatives to the mainstream energy brands has sparked the SKU’s growth. To build the line out, LIFEAID is reformulating the product to increase the caffeine — sourced from green tea — to 100 mg per serving and refining the blend of Nootropics, which may improve brain function. For the first five years after its 2011 launch, LifeAid was exclusively an ecommerce product. However, over the past three years the brand has rapidly ballooned its presence in conventional retail and gyms, currently counting 20,000 points of distribution nationwide — double where the company was a year ago. In retail, the brand has seen over 100 percent growth and in Whole Foods, Melehan said, same store sales are growing 50 percent year over year. However, the ecommerce side of the business, Hinde said, has provided the company with a list of roughly 300,000 consumer email addresses that can be tapped for new product launches and drive repeat customers out to retailers. Partnerships with fitness brands like CrossFit and Spartan Race have helped LifeAid attract a loyal base of athletic consumers for its core products, but the diverse line of need-state based drinks has led those consumers to buy the brand’s other SKUs. Rather than focusing on in-store promotions, Melehan said, LifeAid has worked on building its field marketing team to continue to add retailers and touch new consumers at events — from obstacle course events to music festivals — across the country. He added that the company is opening up more DSD distributors, particularly on the west coast, and will be increasing its field marketing team from 72 full-time employees to 85 in order to match the new distribution.